Pineapples, Bicycles and Bulb-outs (Oh My!) 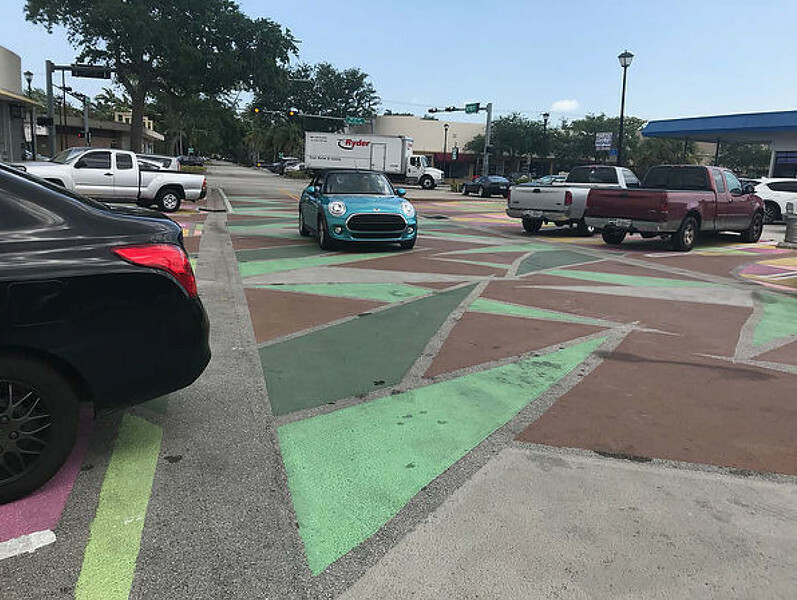 - South Florida-based city planner Melissa Hege explores what the Village of Miami Shores has done to revitalize itself with bike-friendly multimodal streetscaping. Some cities cry out for attention while others quietly progress with spectacular results. 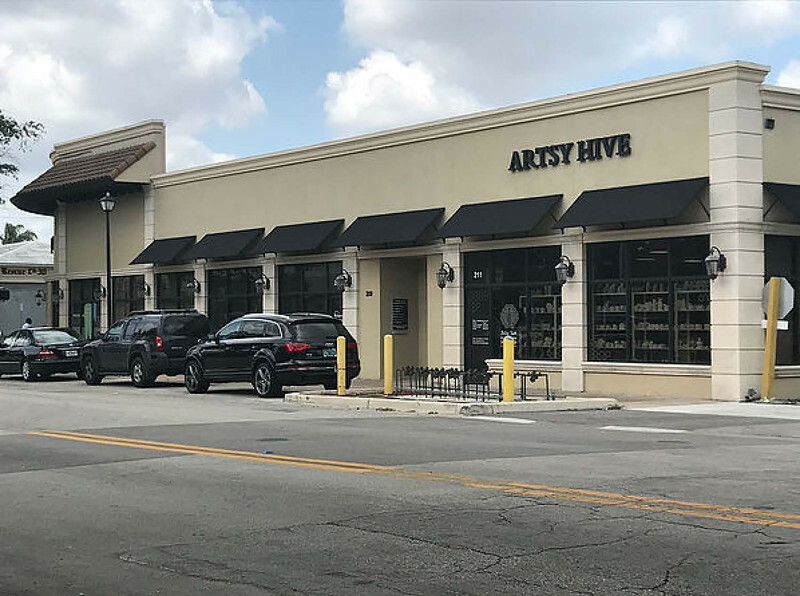 The sleepy little Village of Miami Shores, just seven miles north of downtown Miami, has been quietly tending to its small downtown with simple and bold designs. Where bigger municipalities tend to struggle with the small solutions, this village is blazing forward. Let’s see how. Just to be clear, the name “village” conjures images of a quaint mountain settlement with lush green landscape, fuzzy white sheep and a simple life. Specifically, I think of the Swiss Alps and the childhood character Heidi. I can guarantee there are no sightings of Heidi in Miami Shores, or even sheep for that matter, but there are elements of a quaint and slower pace of life which are made so much better by these designs below. Less traffic, more people is a great equation for bicycles. In the last year, I began to notice these green bike symbols called sharrows. Sharrows mean that bikes can share the same road with cars. Most sharrow pavement markings are difficult to see and confusing to understand. 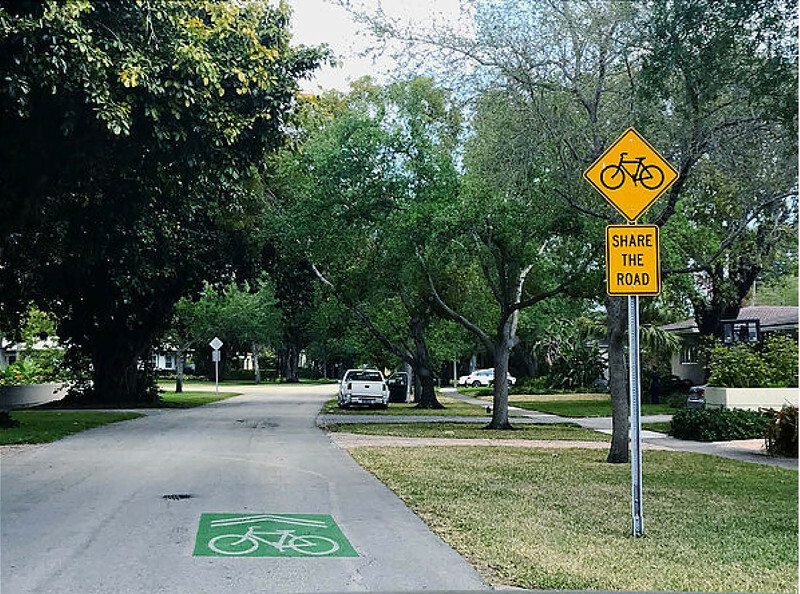 Miami Shores made the standard markings better by painting them green and adding a sign “(hey dude) share the road”. Don’t have your own bike? 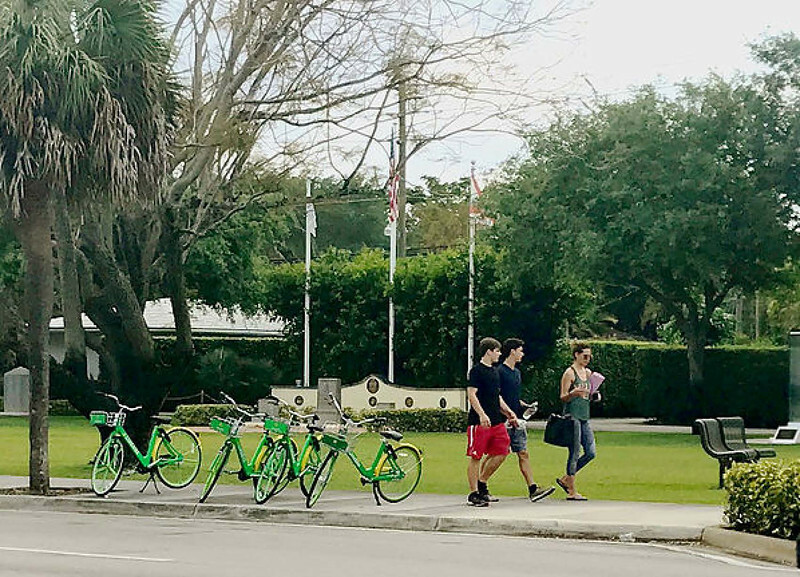 Miami Shores was one of the first to bring on dockless bike sharing. Dockless bike share lets you rent a bike using an app on your phone. You pick up a bike on the street, pay, unlock it, ride and complete the transaction by leaving it wherever you’d like. Bikes are tracked and monitored through gps. So what about the village center? 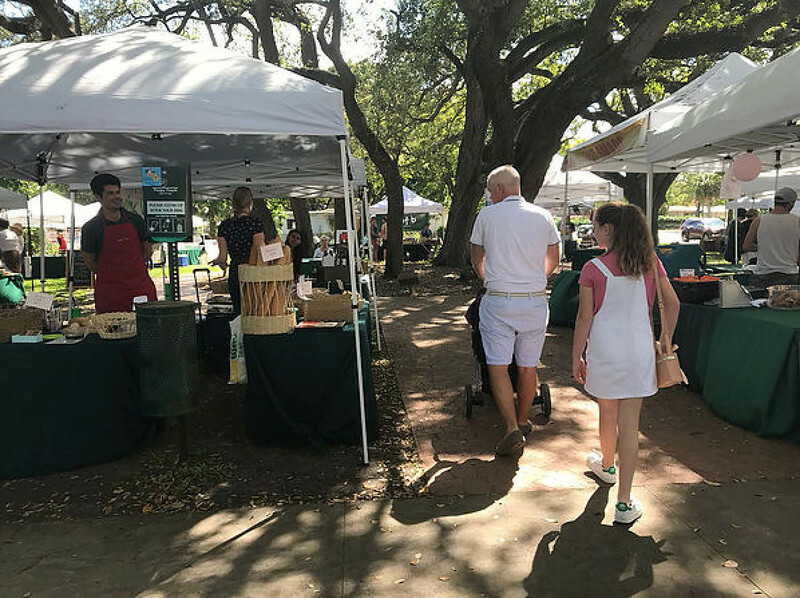 On Sundays, the Village hosts a farmer’s market in this village center park. 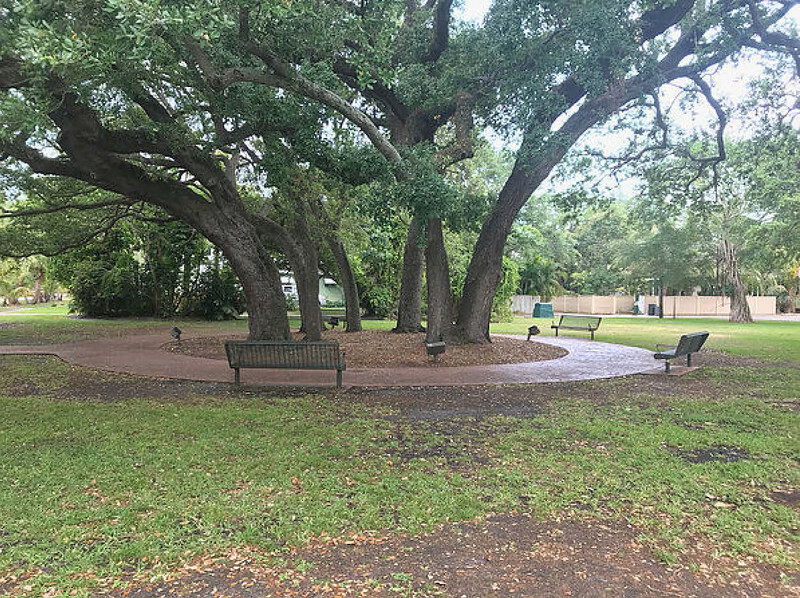 It varies in size from week to week, but what’s consistent is the large shade trees, and serene setting. Here’s a picture of the same park during the week. A simple design that works well is all that is needed. And it keeps getting better. 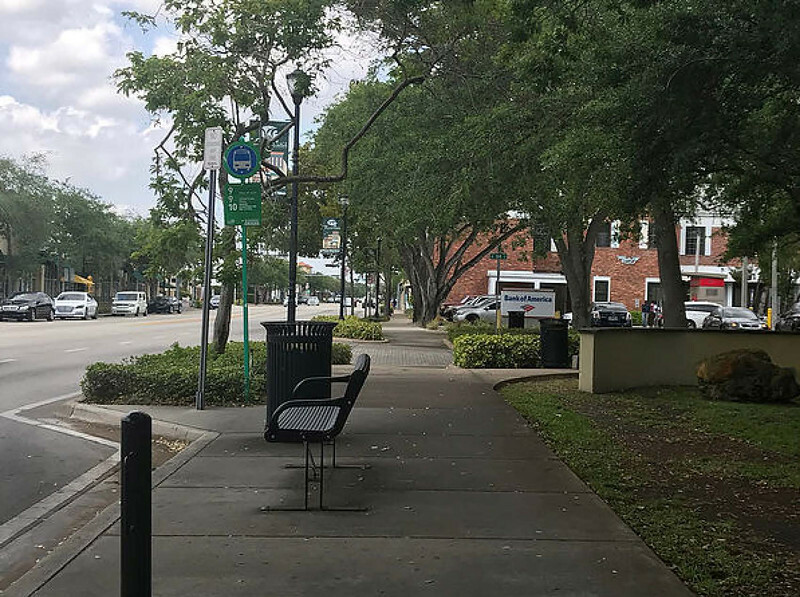 The bus stop on the edge of the park is one of the most dignified I’ve seen in all of Miami. 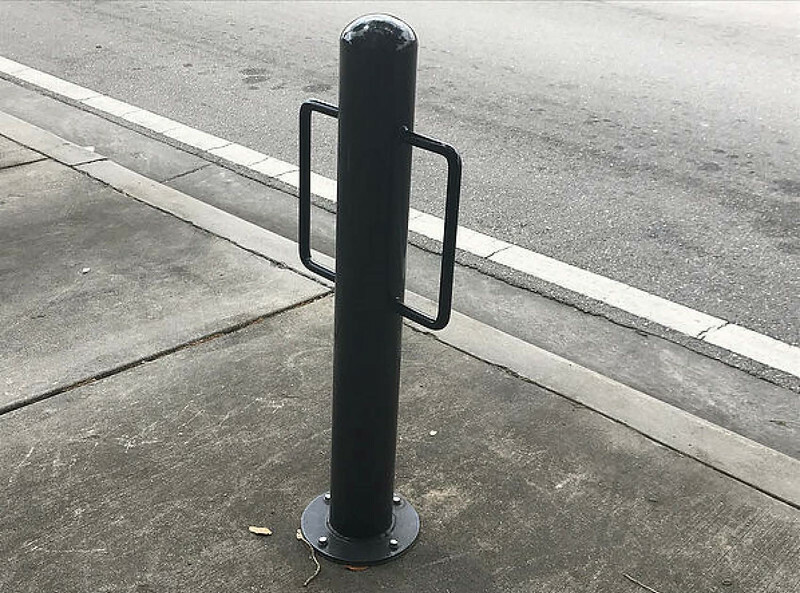 It’s shaded, has a comfortable bench on a wide sidewalk with pleasant green plantings, a trash receptacle and bike post to fill in the space and oh, that bulb out. But we’ll get to that later. 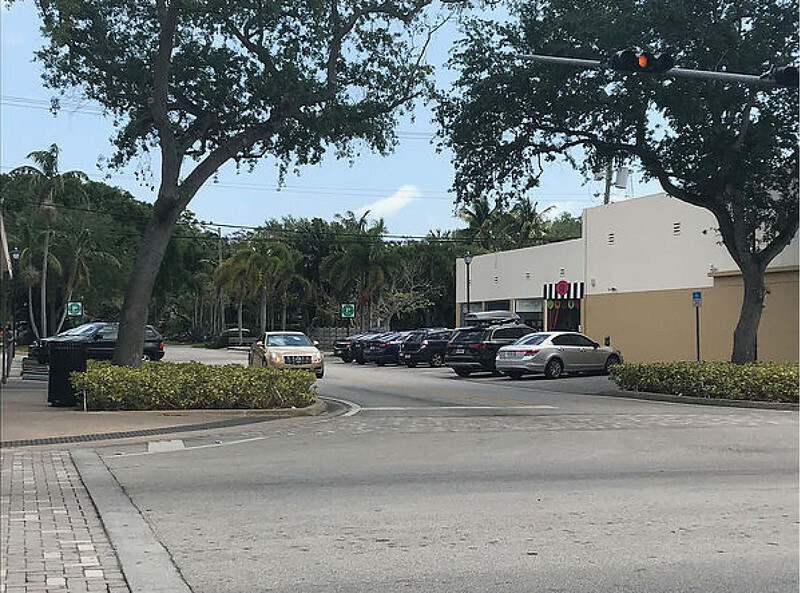 And it’s not just parks in the village center. There are some pretty great businesses which are bringing more people here. This is one of my favorites - a local business for pottery painting. Regular programs and classes give people a reason to keep coming back and walk around the neighborhood. More people makes for more people watching and everyone loves to people watch. The French perfected this with their ubiquitous outdoor cafe tables and chic sunglasses. But that’s another blog post. Kind of a funny term, bulb-out. It’s a rather utilitarian and inelegant descriptor of how the corners of the sidewalks expand out and into the intersection to narrow the crossing distance and make a little extra room for plants, trees, benches, lights and even cafe tables which I found in some examples in Asheville. 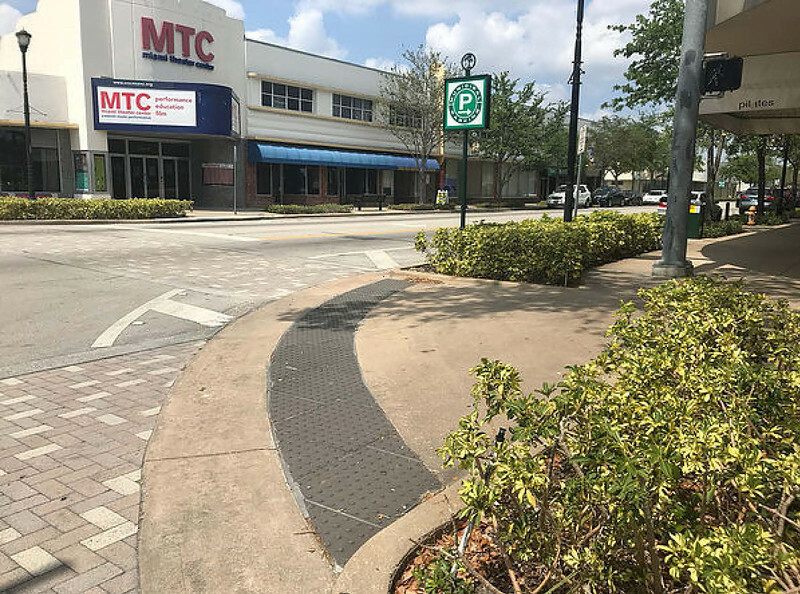 The image above shows nice wide plantings, a textured pavement to warn people they are approaching the edge of the street and a brick paved crosswalk- a step up from the typical yellow paint number. Here’s another view which shows two fairly large oak trees which are elegant and practical. I really like how they frame the street entrances for this strip of retail. And here it is. The piece de resistance - the pineapple plaza. Street by day, plaza by weekend special event. A little paint and a good idea does the trick. 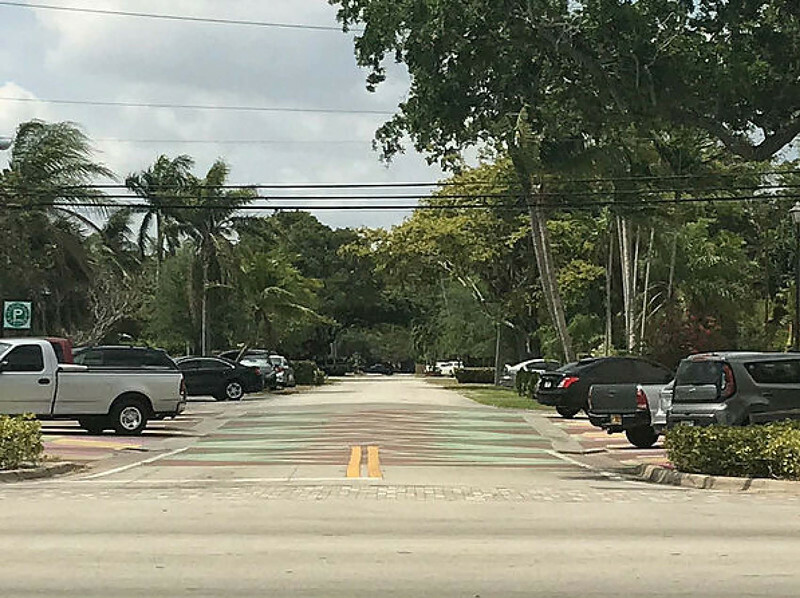 Conceived of and executed by some very talented and creative Miami Shores design and planning professionals, they really pulled it off well. Here’s a closer view. It still works as a road with angled parking. 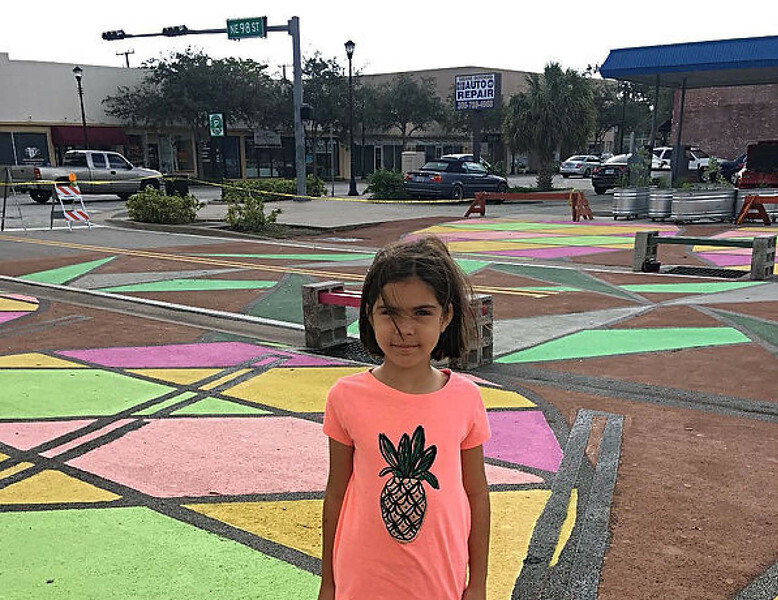 The difference is the Village can close off the street to cars for special events and the paint visually ties the whole thing together so that it feels like a special place. 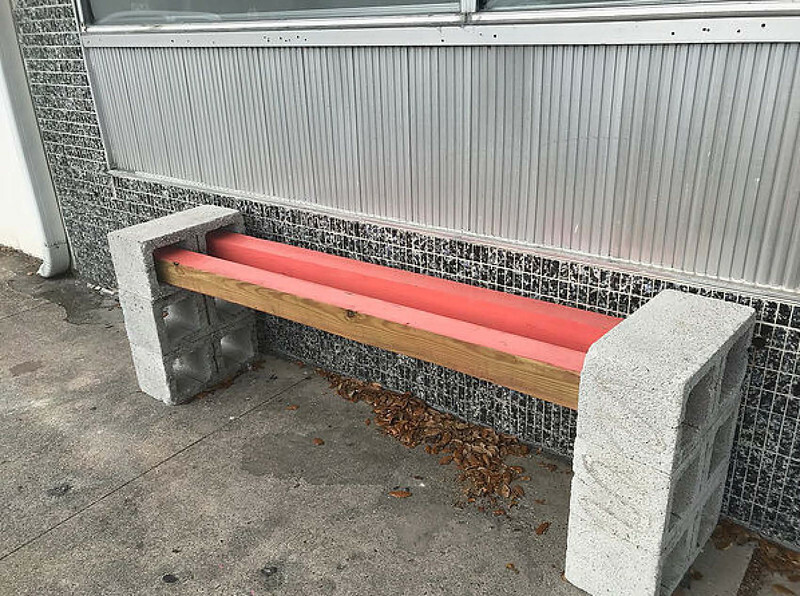 Pictured above is pretty cool bench. Look closer. 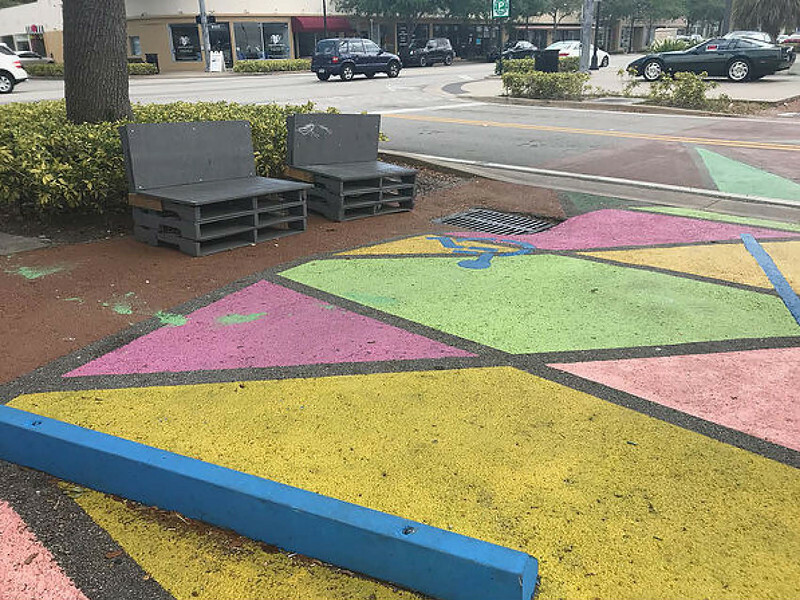 Six concrete blocks- three on each side- two wood planks and some paint are all they needed. Anyone can do this. Another kind of seating is created by modifying wooden palettes. The gray paint makes them a little more sophisticated don’t you think- especially against the bright pavement paint? 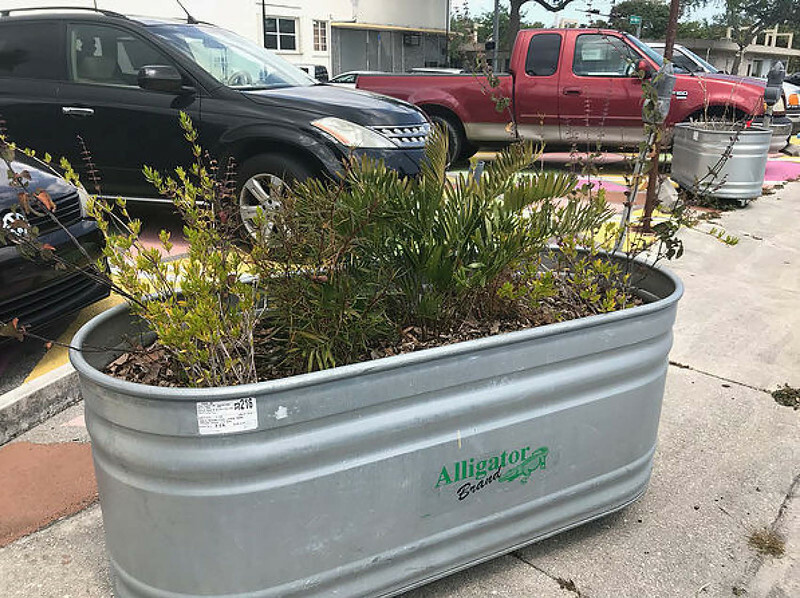 What do you get when you combine a metal trough with some plants and a sidewalk–a sidewalk planter! The planter buffers the parked cars from the sidewalk so that people walking have some barrier separating them the vehicles. 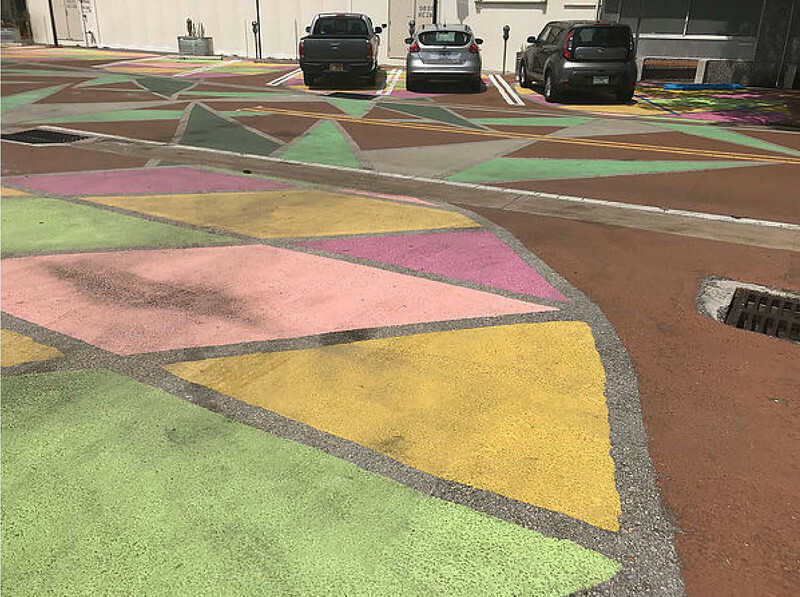 They also decorate the parking area and add some greenery. So what can learn from all this? Small changes which are creative and simple can have a big impact. Don’t underestimate the power of small (or American towns which call themselves villages). Maybe Heidi is painting pottery on NE 96th street instead of drinking hot cocoa in the Swiss Alps!